We hope you enjoy your visit to S.O.S. There are some great photo opportunities here, so why not enter your best photo of the day into our 2019 Wildlife Photo Competition? 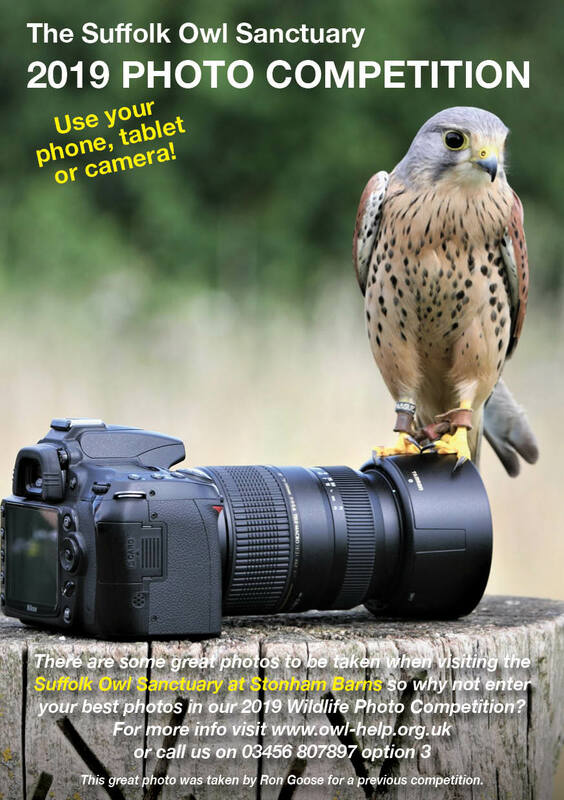 Prizes will be awarded for the best photographs taken of any bird or animal at the Suffolk Owl Sanctuary before October 31st 2019. Digital or photoprint images will be eligible, taken on your ‘phone or camera. There are two age categories: Junior - aged 17 and under and Senior aged 18 & over. First Prize - Free Annual Pass to S.O.S. Second Prize - Free Family Day-Pass to S.O.S. First Prize - Free Photo Day Experience at S.O.S. Second Prize - Free Annual Pass to S.O.S. Third Prize - Free Family Day-Pass to S.O.S. Entrants may submit up to 5 images. To enter by email, digital images should ideally be of medium resolution (say, 150dpi - 1200 x 1500 pixels) or higher. Please send your images to sosphotocomp@gmail.com and include in the subject line of your email and on each image submitted your first name, surname and age. To enter by post or in person, please provide 10” x 8” (25 x 20cms) photoprints to Catherine Irving at Suffolk Owl Sanctuary, Unit 22 Stonham Barns, Pettaugh Road, Stonham Aspal IP14 6AT. Please include a covering letter with your contact details and mark each image on the reverse with your first name, surname, age and title of the photo if you have one. Please keep a copy of your entries as the originals will not be returned. Please note: While digital adjustments are allowed, adding or removing objects, animals or parts of animals are not. The competition is closed to employees of SOS or individuals involved in its organisation or judging, and to those earning more than 5% of their annual income as a professional photographer. A panel comprising staff and management of SOS will select and award prizes to 3 entries from both the Junior and Adult sections of the main Competition. Further images will be selected and made available to the public for a separate online vote promoted via social media: the entries in both Junior & Adult categories with the most ‘likes’ in the social media vote will receive a People’s Choice Special Award. Selected entries to the competition may be featured by Suffolk Owl Sanctuary online, in publicity materials or as merchandising. Entries must be received by the closing date of October 31st 2019 and the results will be announced and winners advised at the end of November. Please note that full details of the rules are published online at www.owl-help.org.uk. It is the responsibility of each entrant to ensure that they have read them and entries will be accepted on this basis. Happy snapping! For further details, please call us on 03456 807 897 or contact us below - and good luck!